I saw this idea last year at Dollarstorecrafts and I knew I had to try it out. I had already purchased the ice molds (they have them again this year, including different shapes like the pumpkin). I went a little different route. I discovered awhile ago that you don't actually have to buy those blocks of soap to make soap. I made these recycled soap molds for my bathroom using extra soaps I had from hotel visits. So...the beauty of this project is it literally just cost me the dollar I spent for the mold. The soap was sort of hard, usually you can just throw it in a pan with a little water, heat, stir, melt, pour. This time, I set the hotel soaps in a dish of water overnight so it was soft. I pour out the extra water. The soap was really pliable, so I pushed it into the molds. 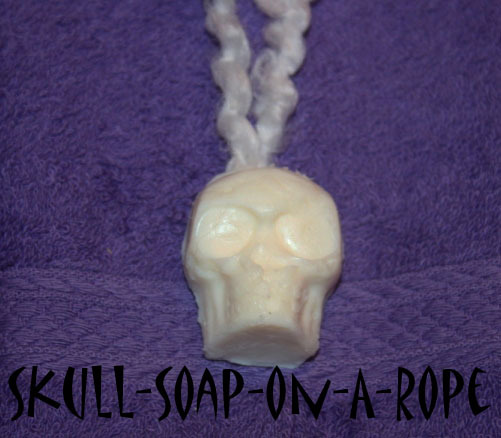 I tied some yarn, and pushed the knots down into the skulls, and covered it with more soap. I let it dry...and then....ta da-skull-soap-on-a-rope for my little friends this Halloween. You seriously are a genius! LOVE these! Wow! Love this! 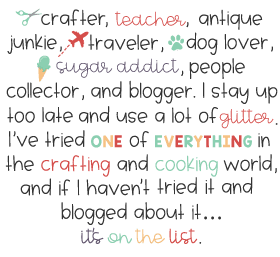 :) gonna have to put this on my things to do!